Swirling soup of matter’s fundamental building blocks spins ten billion trillion times faster than the most powerful tornado, setting new record for “vorticity”. 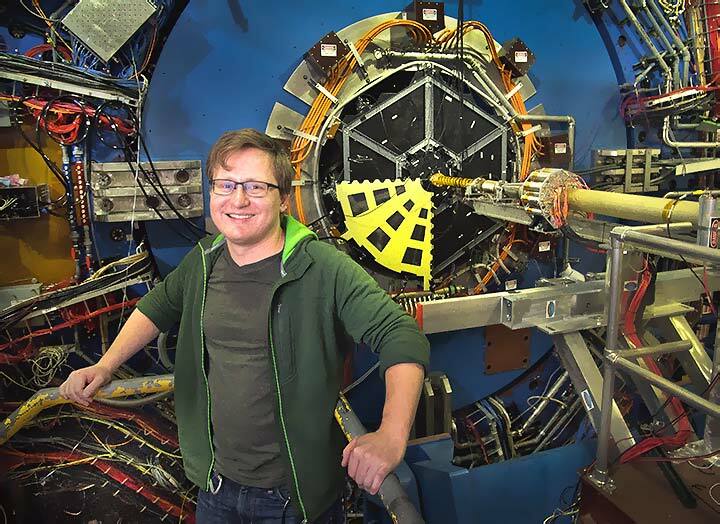 Ohio State University graduate student Isaac Upsal helped lead the analysis of results from the STAR detector that revealed a “vorticity” record for the quark-gluon plasma created in collisions at the Relativistic Heavy Ion Collider (RHIC). 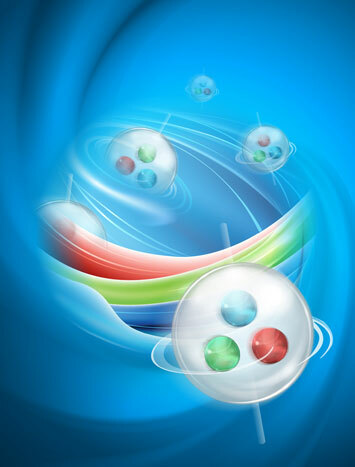 Particle collisions recreating the quark-gluon plasma (QGP) that filled the early universe reveal that droplets of this primordial soup swirl far faster than any other fluid. The new analysis of data from the Relativistic Heavy Ion Collider (RHIC) — a U.S. Department of Energy Office of Science User Facility for nuclear physics research at Brookhaven National Laboratory — shows that the “vorticity” of the QGP surpasses the whirling fluid dynamics of super-cell tornado cores and Jupiter’s Great Red Spot by many orders of magnitude, and even beats out the fastest spin record held by nanodroplets of superfluid helium. 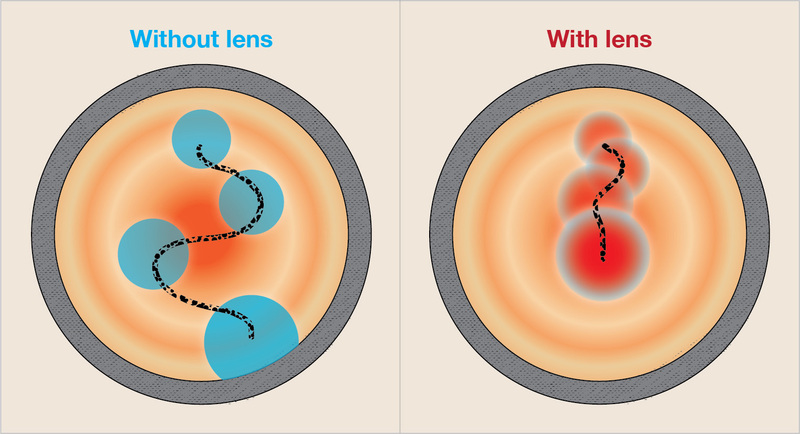 The results, just published in Nature, add a new record to the list of remarkable properties ascribed to the quark-gluon plasma. This soup made of matter’s fundamental building blocks — quarks and gluons — has a temperature hundreds of thousands of times hotter than the center of the sun and an ultralow viscosity, or resistance to flow, leading physicists to describe it as “nearly perfect.” By studying these properties and the factors that control them, scientists hope to unlock the secrets of the strongest and most poorly understood force in nature — the one responsible for binding quarks and gluons into the protons and neutrons that form most of the visible matter in the universe today. Specifically, the results on vorticity, or swirling fluid motion, will help scientists sort among different theoretical descriptions of the plasma. And with more data, it may give them a way to measure the strength of the plasma’s magnetic field — an essential variable for exploring other interesting physics phenomena. “Up until now, the big story in characterizing the QGP is that it’s a hot fluid that expands explosively and flows easily,” said Michael Lisa, a physicist from Ohio State University (OSU) and a member of RHIC’s STAR collaboration. “But we want to understand this fluid at a much finer level. Does it thermalize, or reach equilibrium, quickly enough to form vortices in the fluid itself? And if so, how does the fluid respond to the extreme vorticity?” The new analysis, which was led by Lisa and OSU graduate student Isaac Upsal, gives STAR a way to get at those finer details. Telltale signs of a lambda hyperon (Λ) decaying into a proton (p) and a pion (π-) as tracked by the Time Projection Chamber of the STAR detector. Because the proton comes out nearly aligned with the hyperon’s spin direction, tracking where these “daughter” protons strike the detector can be a stand-in for tracking how the hyperons’ spins are aligned. “The theory is that if I have a fluid with vorticity — a whirling substructure — it tends to align the spins of the particles it emits in the same direction as the whirls,” Lisa said. And, while there can be many small whirlpools within the QGP all pointing in random directions, on average their spins should align with what’s known as the angular momentum of the system — a rotation of the system generated by the colliding particles as they speed past one another at nearly the speed of light. Meanwhile, STAR’s Time Project Chamber, a gas-filled chamber that surrounds the collision zone, tracks the paths of hundreds or even thousands of particles that come out perpendicular to the center of the collisions. 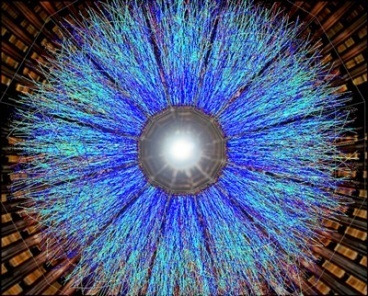 “We’re specifically looking for signs of Lambda hyperons, spinning particles that decay into a proton and a pion that we measure in the Time Projection Chamber,” said Ernst Sichtermann, a deputy STAR spokesperson and senior scientist at DOE’s Lawrence Berkeley National Laboratory. Because the proton comes out nearly aligned with the hyperon’s spin direction, tracking where these “daughter” protons strike the detector can be a stand-in for tracking how the hyperons’ spins are aligned. 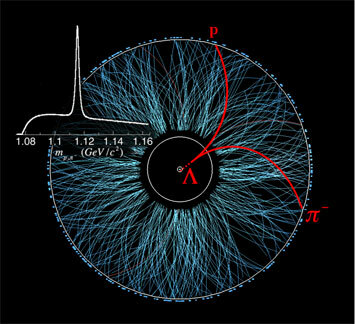 Tracking particle spins reveals that the quark-gluon plasma created at the Relativistic Heavy Ion Collider is more swirly than the cores of super-cell tornados, Jupiter’s Great Red Spot, or any other fluid! The results reveal that RHIC collisions create the most vortical fluid ever, a QGP spinning faster than a speeding tornado, more powerful than the fastest spinning fluid on record. “So the most ideal fluid with the smallest viscosity also has the most vorticity,” Lisa said. This discovery was made during the Beam Energy Scan program, which exploits RHIC’s unique ability to systematically vary the energy of collisions over a range in which other particularly interesting phenomena have been observed. In fact, theories suggest that this may be the optimal range for the discovery and subsequent study of the vorticity-induced spin alignment, since the effect is expected to diminish at higher energy. Increasing the numbers of Lambda hyperons tracked in future collisions at RHIC will improve the STAR scientists’ ability to use these measurements to calculate the strength of the magnetic field generated in RHIC collisions. The strength of magnetism influences the movement of charged particles as they are created and emerge from RHIC collisions, so measuring its strength is important to fully characterize the QGP, including how it separates differently charged particles. “Theory predicts that the magnetic field created in heavy ion experiments is much higher than any other magnetic field in the universe,” Lisa said. At the very least, being able to measure it accurately may nab another record for QGP. Research at RHIC and with the STAR detector is funded primarily by the DOE Office of Science.